And get back to your normal daily life! The Portuguese implantologist Malo has formalized this technique which has subsequently become globally recognized. “Four” and “six” are the number of implants considered indispensable. 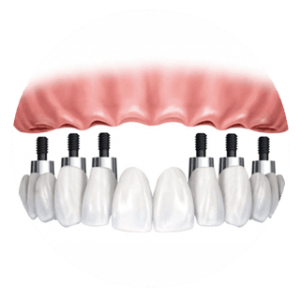 The all on six methodology allows the dentist to solve the problem of a lack of teeth by inserting six implants instead of four, as in the case of the four fixed prosthesis implants. Dentiamo doctors perform this procedure with all the requisite expertise for the procedures in this regard. The implants are a comfortable and final solution also for fixing le protesi dental prostheses to eliminate the annoying use of fixing pastes. 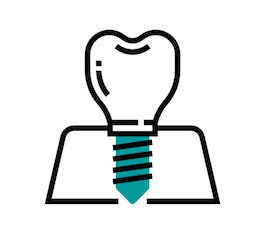 The implantation of an artificial titanium root allows a bridge to be made without having to remove the healthy teeth, if they were still present, using the implant as a support tool and not the existing teeth. It is possible to choose the shape and color in such a way as to reflect the natural color of the customer’s teeth. A spectrophotometer allows you to objectively read the original dental color of the client thus allowing for personalized results.